You won’t see this in a museum or art gallery; it’s tucked away in a basement at UCLH. But it feels right. You have to be down in the bowels of the building to see it; you have to be more than simply a visitor. 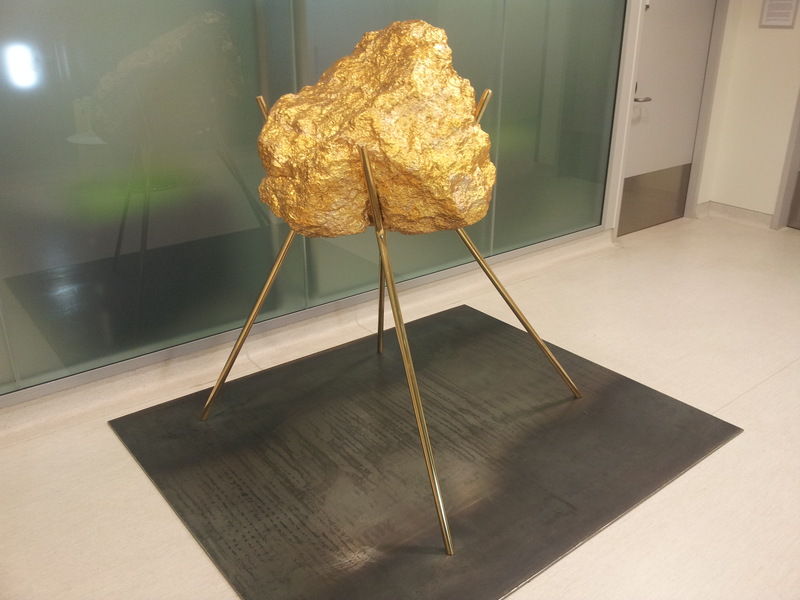 The sculpture, “To Catch a Falling Star”, is on the landing of the lower ground floor of UCLH’s Macmillan Cancer Centre in Huntley Street. It was presented to the centre by Ealing artist Roger Partridge. The title of the sculpture, while being a metaphor for the medical treatment of cancer or the doctor-patient relationship, also acknowledges what Roger describes as “the fractal link between the very large stars in the universe and the very small cells and molecular structures within our bodies”. The organically formed limestone sculpture, ‘caught’ in the air stands on brass legs on a steel plate. The stone, formed from deposits 170 million years ago is covered with a thin layer of metal leaf representing a sparkling yet fragile present timescale. This entry was posted on Tuesday, September 30th, 2014 at 7:47 am	and tagged with Macmillan Cancer Centre, Roger Partridge, To Catch a Falling Star and posted in Macmillan Cancer Centre, Roger Partridge, To Catch a Falling Star. You can follow any responses to this entry through the RSS 2.0 feed.